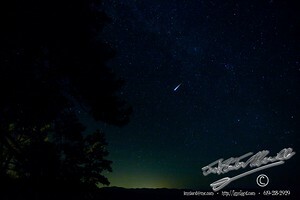 Perseid Meteors 20100812-EarlyAM on Vimeo. I did mention this was coming. This is a time lapse video created from 1100 still images that were taken on August 12th between sometime between 01:30 in the morning and 03:30 in the morning. If you really want to know the time, ask me and I can give you a specific time for each frame. The exposures were five seconds long. I shot wide open as fast I could, trying to get the brightest image I could have, of the meteors, in relation to the stars. … The stars were exposed for five seconds, but the meteors ran through the frame very fast, not even close to a full second, so they had to be very bright to be seen. If you look very carefully at individual frames, you will see many small meteors, but about 36 seconds into the video, you will see one humongous meteor. And, if you look really hard, you will see a cloud of glowing gas slowly expand for the next few seconds of the video. That expansion took place over three full minutes. Amazing! After a quick look through about fifteen percent of the images I shot last night, this image jumped into my eyes, and I thought I would share it. I do have many more images of meteors streaking across the sky in the fifteen percent of the images that I have looked at, but most of them are about the brightness of a medium bright star, this one is not; it is brighter.